Time to start the new Year off with a test race and since the focus is on getting ready for Boston I chose to return to this race. As you can see in the photo , I have been here before. In 2006 as I was preparing to attempt to qualify for Boston at the MB Marathon in February, I made the trip with Jerry and the Werners to Ocean Isle Beach. I hated to skip the Frosty 50K, especially since The Ultra Angel would be making her Ultra debut but I had focused on preparing for Boston and an ultra didn't fit the plan. It turned out to be a cold and windy morning for this race but my training was going well. Even so I must say I was shocked to run as well as I did finishing in 1:38 and winning my age-group. This was a good sign that I was on track for a marathon pr which I got along with the qualifier a few weeks later. Karla placed in her age group and ran a pr. We were both all smiles of course but at the time we didn't know that just 4 weeks later she would be diagnosed with stage 3 cancer. But that's another story. So here I am again 5 years later but this time I already have my qualifier. No Jerry or Werners along this year but Mountain Girl Lisa is here and I expect she will probably run another pr. I know there is no way I can run 1:38 again but I will run as hard as I can and be thrilled if I can run 1:45 or better. 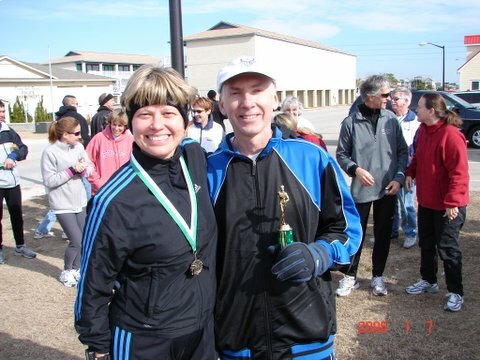 North Raleigh Running Threat Laura Frey is running too and I look forward to her smoking the course tomorrow. More details and report sometime tomorrow night.